Launceston, Cornwall the place. | Launceston Then! Much of the following information has been taken from the excellent histories of the town by Richard and Otho Peter and Sir Alfred Robbins. 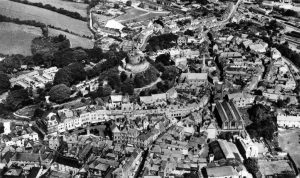 The Cornish name of “Launceston”, Lannstevan, means the “church enclosure of St Stephen” and is derived from the former monastery at St Stephen’s a mile and half north-west (the castle and town were originally named Dunheved) and the Common Brittonic placename element lan-. From ancient scrolls, deeds and articles the town has been called: Launcestreton, Lanstuphadon, Laundscireton, Launcestona, Lanscaveton, Lanzaventon, Lanzaneton, and Launcendaniton. ‘Lanscaveton’ is mentioned in Domesday as the manor of St. Stephen canons. Some academics in the past have suggested that the original name was ‘Lanstuphadon,’ the church of St. Stephen. Another theory was that it was originally ‘Laundscireton,’ which, split into sections, would give ‘Laundscire as equivalent to region and ton to town, the whole meaning the town of the region or capital. The nearest to ‘Lanson’ is ‘Lancestona’ is found in the foundation deed of the Priory. What we can assume is that the name can most likely be attributed to the ‘Normans’ as before the conquest the area was known as ‘Dunheved’ which is supposed to be a Saxon word signifying the head or summit of the hill. Here one academic disagree’s by stating that the original would have been ‘Dunheafod’ signifying ‘heafod’ as chief, and the whole thus meaning chief of the hills. One final theory could push the towns history to an earlier period by reasonably assuming that the first syllable being derived from the Gaulish ‘Dunon,’ the Welsh ‘Din,’, and the Irish ‘Dun’, indicating a town or fortress. The earliest known Cornish mint was at Launceston, which operated on a minimal scale at the time of Æthelred the Unready before Cornwall received full diocesan jurisdiction in the year 994 AD. Only one specimen is known to exist. In the reign of William the Conqueror, the mint was moved to Dunheved and remained in existence until the reign of Henry II, 1160. During the reign of Henry III of England, another mint was established in Launceston. Launceston Castle, which dominates the town, is a Norman castle of motte-and-bailey design and was built by Robert, Count of Mortain (half-brother of William the Conqueror) c. 1070 to dominate the surrounding area. Launceston was the caput of the feudal barony of Launceston and of the Earldom of Cornwall until replaced by Lostwithiel in the 13th century. Launceston was later the county town of Cornwall until 1835 when Bodmin replaced it. The history is there for all to see, from the Norman conquest through the Civil war right up to its use by the USA army and the air ministry in the 2nd World War. For Launceston, the Castle is the town, as the old town clings tightly to its boundaries. In Domesday Book (1086) it is recorded that Launceston was held by Robert, Count of Mortain and that he had his castle there. There was land for 10 ploughs, 1 villein and 13 smallholders with 4 ploughs, 2 mills which paid 40/- (£2 sterling) and 40 acres of pasture. The value of the manor was only £4 though it had formerly been worth £20. Launceston Priory was a priory at Newport and was a house of Augustinian canons. It received a charter in 1127, replacing an earlier foundation of secular canons at St Stephen’s. It was dissolved in 1539, and the site leveled. Although it can be said with some sadness that there is little left of the Priory, but as is the case with the Castle, there are probably many buildings around the town that exist with much of its fabric taken from the demolished Priory. The site was re-discovered in 1886 and 1888 (during the construction of the railway and a gas holder) and excavated by Mr. O. B. Peter, thus allowing the plan to be reconstructed. In the late 20th century the ruins fell into disrepair, but in recent years they have been consolidated, the grounds tidied up, access improved and interpretation boards set up. The ruins are now cared for by the Friends of Launceston Priory in partnership with Launceston Town Council. During the English Civil War Launceston was known to be Royale et Loyale to Charles I of England, hence its coat of arms. His son, who was later crowned Charles II of England, stayed in the town (said to have been Madford House, but there is no evidence of this) for a couple of days en route to the Cavalier army based further west. In 1643, the Parliamentarian forces under the command of Major General James Chudleigh advanced in an attempt to capture Launceston from the Royalists. The Royalist commander, Ralph Hopton, 1st Baron Hopton, stationed his forces on the summit of Beacon Hill, a steep hill which overlooks the town. The Parliamentarians captured the foot of the hill but were unable to dislodge the Royalist forces from the top. Hopton led a counterattack down the hill and, despite fierce fighting and the arrival of Parliamentary reinforcements, forced Chudleigh’s troops to retreat. Sir Richard Grenville, 1st Baronet was committed by Prince Charles to Launceston Prison for refusing to obey Lord Hopton; Grenville had already quarreled with General George Goring, Lord Goring. Launceston has the only document in the UK signed by Mary II of England and her husband, William III of England. Launceston is said to have gained its historical importance from being the furthest into Cornwall that Justices and other Officers of the Crown felt safe to venture. (A more realistic reason was the very poor means of transport and lack of suitable roads within Cornwall at the time which did not begin to be improved until the late 18th century.) When this situation had been improved, Bodmin became the county town (in 1835) with the benefits that would bring. Launceston’s role as the de facto county town of Cornwall became established in the 13th century but it was never officially designated as the county town. In the early 19th century, Launceston gave its name to the settlement which is now the second largest city in Tasmania. The early nineteenth century saw a dramatic change in the town with both Western and New North Roads (now St. Thomas Road) being constructed thus making it easier to travel through and to the town. In the early part of the century the Walk was laid out by the Corporation, and the churchyard (which in 1765 had been added to by purchase, and which was further enlarged in 1809) added to by purchase, and which was further enlarged in was cut in two by a path leading from Church Stile to the Higher Walk, and passing over the vaults of some of the oldest families in the town. About the same time a piece of land near the chancel door, on which had stood two houses, was added to the church area, and a window compartment, previously blocked by these dwellings, was opened to view, thus completing the fabric in its present state. In the first year of the century an Act was passed in continuation and amendment of the measure of 1781 dealing with the Launceston roads, and extending its powers to the road from the “West Gate under Madford in Launceston by Dockacre, to the North Gate in Launceston,” and this in its turn was amended fourteen years later. Under the provisions of these Acts, the North Road, the Exeter Road, and the Tavistock Road were made. However, the town witnessed a period of industrial decline with the closure of much of the Wool industry at Newport, due to the industrial revolutions advancement in the North of England. The wool spinning factories of Richard Frost closed in 1825, Messrs James, John, and Thomas Langdon’s business failed and closed in 1826, and the last factory run by William and Thomas Pearse closed in 1834 putting several hundred out of work. The serge mill of the Searle brothers also closed down in 1826, ending over 200 years of serge being produced in Launceston. The accumulating effect of all these closures was amplified with the removal of the County assizes in 1838. It was on August 27th, 1838 that Lord Denham, then Lord Chief Justice of England, sat in the Criminal Court, and, having sentenced as the last case a boy, thirteen years old, to penal servitude for life for stealing three gallons of potatoes, he observed, “I have a word to say before I vacate my seat”; and, looking up to the gallery in front of him, he added “I see a few of the Grand Jury present: I have to inform you that the new hall at Bodmin is all but completed; therefore the assizes will be held at that town in the future.” And with these words the holding of assizes at Launceston closed for ever, taking with it a whole host of much-needed trade. The returns of the visiting justices for 1823 and 1824 showed that the gaol was kept cleaner than in older days, and that of 1825 that some alterations had lately been made for the better accommodation of the female convicts ; but a significant addendum to the last was made by the Clerk of the Peace (then Mr. Edward Coode)—”And I further certify that an addition to the gaol at Bodmin is in considerable forwardness.” This was completed in 1828, and in 1829 the gaol establishment at Launceston was broken up. it interfered with the traffic— a pretence disposed of by the fact that the traffic by that time had been diverted to the North Road. It was widely felt and supported that the only way to improve things for Launceston, would be to have a link to the national railway and schemes were put forward as early as 1836, although it would be nearly thirty years before the railway, in the form of the Launceston and South Devon, did arrive, with a grand opening on a very wet 1st of June 1865. The decline was halted and Launceston, with its new terminus, began to prosper. A new line brought in from Halwill by the London and South Western railway was opened in July 1886 which eventually ran all the way to Padstow. This latter line gave the town a more direct route to the rest of the country and heralded a new era of travel. (The coming of the Railway). One of the consequences of the railway was the cutting of the new Dunheved Road from Badash Cross to Westgate Street also in 1865. The road from the outset was designed to be one of the more upmarket roads within the town, with fine town houses the length of its course, which were to offer great views. At roughly the same time that the railways arrived, Launceston’s first dedicated hospital was erected in the Western Road and in 1871 this was enlarged at a cost of £1,200. In 1873, through the endeavours of the town’s many non-conformists, Dunheved College (later through amalgamation with Horwell School, Launceston College) was built at the top of Dunheved Road. In 1883, Launceston’s Borough Police Force (which until that point had the force of just the single constable) was taken over by the County Force and in 1885 a new Police Station was opened at the Western end of Westgate Street. In 1899 it was decided that a new cattle market would be advantageous and a site on Race Hill was chosen for its construction. This new market, designed by Otho Peter, meant that the centuries old custom of selling livestock in the streets came to an end, and the market, a monthly affair in those days, soon began to prosper, bringing new trade to the town. In 1913 the new Council School on Windmill Hill was opened and the following year the new Unionist Club building on Western Road was opened. But far from heralding a new dawn, the dark clouds of war shrouded the town and district just as it held its ugly hold on the rest of the World. The war memorial, built in 1921, lays bare to the town’s sacrifice with 83 of Launceston’s finest listed, the district as a whole lost a further 134. Hundreds more went off to serve their country, returning with the experience of what they saw and witnessed etched into their minds. Many struggled with these memories and were restless souls. Whole families such as the Brighton’s and Medland’s were cut apiece by their losses. 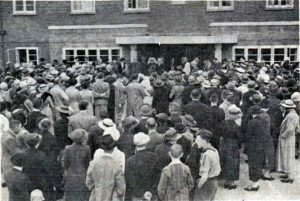 The town itself played an important part, first of all by taking in Belgium refugees and then in 1915 by converting the Town Hall into a hospital before this was later moved to Werrington House. The erection of the war memorial, with the foundation stone being laid by the Prince of Wales, went someway to easing away the war experience and Launceston’s life slowly got back it’s normal routine. Between the war’s, progress was made in regard to the healthcare of the town and its district, with a new Hospital being built by public subscription and opened on land at Longlands which was donated by Charles Gillbard. Charles proved to be a great philanthropist when he also gave and laid out Coronation Park next to the Windmill Pleasure Park. But again the hope that this brought was soon dashed as a new war began. Launceston again played its part with many of its men mobilising. The town played host first with the U.S. Army at the Pennygillam and Scarne camps which were then subsequently turned into camps for the P.O.W.’s. The town also had its sad share of loss with 37 townsmen losing their lives. There were only a couple of occasions of bombing, one near Lawhitton and the other on farmland near St. Stephens, but no damage was caused. The Castle Green was taken over as a field hospital for the American’s with nissen huts constructed along its length (below). These later were taken over by the Air Ministry until their subsequent removal by the Ministry of Works in 1955. With the end of the war, Launceston like so much of the country sought to re-build. 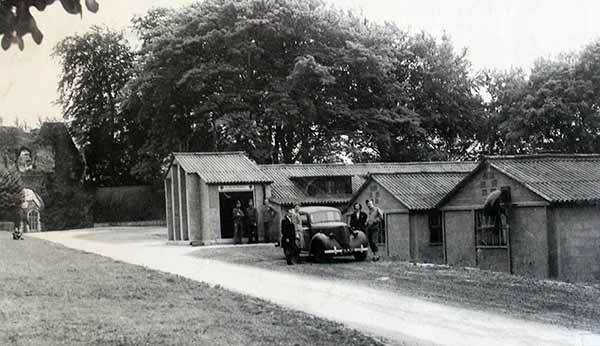 The former camps at Scarne and Pennygillam were soon put to use, with the nissen huts at Scarne converted into makeshift homes with many of these subsequently being demolished to make way for the new Hurdon Way development in the 1950’s. On a field called ‘Broadapark’ immediately north of Penquite on Roydon Road, another development was begun which ultimately led to the construction of 142 dwellings. Pennygillam camp itself became the Town’s very first secondary modern school in the mid 1950’s before it was amalgamated with Launceston College in 1966 to form the comprehensive school we have today. Part of the old school/camp buildings were used by ‘Marathon’ one of the first businesses on Pennygillam, and who would become one of the biggest employers in the area. With the need for new dwellings after the war, Broad Park, Trecarrell, and Hurdon were all soon constructed during the 1950’s. With this substantial level of modern housing stock, the borough council set about tackling the ‘slums’ of the town. Much of the old housing was condemned with the result that in the early 1960’s many of the buildings were demolished as part of the ‘slum clearances. The cattle market was one of the first areas that saw re-development with it being under cover and extended. The pig market was moved and in its place, the Pannier Market (below) was constructed. 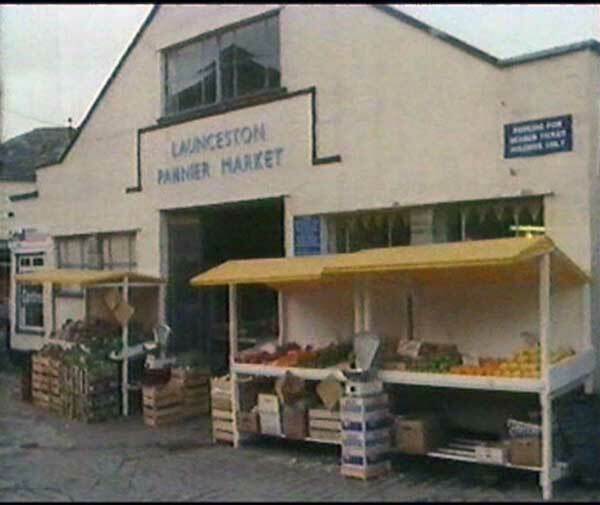 Launceston Pannier Market in the early 1980’s. 1964 proved to be a year of significant change for the town. First of all the Northgate/Tower Street ‘slum clearance’ took place, then in April of that year, it was announced that the Railway Station and the line from Halwill to Padstow would be closing. Also in that year there was a need for a building to house the newly formed Dunheved Petty Sessional Division (after the amalgamation of the East-North Bench of Magistrates and the Launceston Borough Court) and with Hendra House then being vacant (Horwell Girls Grammar School having amalgamated with the College in 1962), it was decided that a former laboratory would make an ideal court room. A scheme costing £5,000 was implemented to convert and adapt the laboratory and to provide additional meeting rooms. At the same time, part of the original house was passed over to house the Civil Defence headquarters. At a further cost of £62,000, the former school’s netball and tennis courts were developed for a new County old people’s home (Miller House). The original plan was for a 36 bed home, but this was subsequently changed to provide 48 beds. As part of the ‘modernisation’ of the town, Madford House was demolished with the new ‘Crown Building’ in its place alongside a new Library. This also allowed for the widening of Madford Lane and entrance to Bounsalls Lane. The top of Race Hill was also widened with the re-development of the area just above the Bounsalls Lane Junction. The idea of a tiered car park on the ‘old sheep market‘ car park was also mooted but eventually dismissed as being too expensive. The old GWR railway line from Plymouth was closed on December 31st, 1962 but the old Southern line had a stay of execution. However, after four more years of doubt, the this to closed for good on October 1st, 1966, leaving the whole of the area cut off from the national rail network. Thus the road network, or more importantly the A30 became the only access to the rest of the country for Launceston and in the summer time particularly, the volume of traffic would often grind to halt. 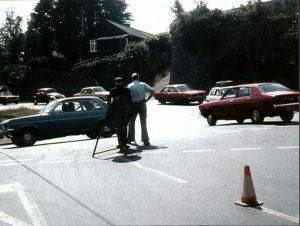 It became quite an attraction on a Saturday for Launceston folk to take up a view on Prout’s Corner to witness the snail’s crawl for the trapped tourist, struggling to make their way up Kensey Hill and around the notorious corner. Prouts Corner, Launceston from Exeter Street. Photo courtesy of Colin Barrett. In 1974, however, work began on a long awaited by-pass to bring much needed relief, which was completed and opened in time for the 1976 summer season. Further work to dual carriage the whole road from Bolventor to Okehampton was completed in 1991, and with further improvements to Whiddon Down, the A30 boasts dual carriageway that connects Launceston to the national motorway system.